Kate: The Montague on the gardens is a luxury four star boutique townhouse hotel, located in Bloomsbury London. The Bloomsbury area of London has traditionally been linked with education and the arts being home to the 'Bloomsbury Group'. The bloomsbury group was comprised of artists, art critics, writers and economists who would regularly meet up and debate current affairs; and it was through this group that the area gained its name. The location of the Montague on the gardens is truly fabulous, and enables guests the very best of both worlds. On the one side, being located in central London desirable locations such as Soho and Covent Garden are within easy distance. The location also allows access to other London hot spots via public transport, enabling guests to maximise their experience. The other side is one that not everybody is familiar with, a much calmer, more tranquil side of London that can be enjoyed via Bloomsbury. Keeping inline with the arts and culture from which the area yields its name, the British Museum can be found just minutes away. The museum is free to enter and boasts an impressive collection of world artefacts and art. Chelsie: Undeniably the Montague on the gardens is in every respect a luxury hotel, but what I feel really makes the hotel stand out is its stately home feel. The hotel itself is beautiful, with rich, lavish decor incorporating a bygone era which perfectly compliments the overall feel of the hotel. From the second we stepped into the hotel the staff were friendly, informative and polite making us feel incredibly valued as they took care of our excess bags and directed us towards our afternoon tea! The Montague on the gardens offers guests two different locations to enjoy afternoon tea, outside on their terrace surrounded by gardens or inside their conservatory which is cute and intimate. Kate and I decided to enjoy our afternoon tea outside, to take full advantage of the greenery which makes for a lovely backdrop. The area is fully equip to handle the somewhat turbulent English weather with discreet outdoor heaters and glass panels to keep you protected but also not impacting your views. The 'Best of British' afternoon tea that Kate and I could not wait to try has been designed by the hotels executive chef, Martin Halls. 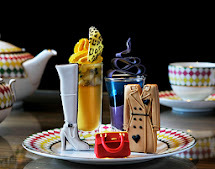 The menu includes a delicious collection of cakes and pastries inspired by London's biggest social events including the Queen's Diamond Jubilee, Wimbledon and London 2012:The Olympics. Kate: Our waitress showed us to our elegantly made up table, and the service she provided from the very beginning was fantastic as she proceeded to explain every detail of the afternoon tea to us. The afternoon tea began with our tea selections, ordinarily this tends to consist of selecting from an imposing list and hoping for the best; this was certainly not the case at the Montague on the gardens! For those of you who are not aware, the hotel has recently received a special award from the prestigious tea guild for its outstanding quality and consistently high stands in tea service. I can honestly say from my experience this award is more then justified, as our tea selection was transformed into an experience like no other. Chelsie and I were presented with a deep leather box filled with numerous twining's teas to select from. Our favourite part, which made the experience so special was the hands on interaction that was encouraged. We both got the opportunity to smell the different teas which allowed us greater insight into what our tea selection would entail alongside picking up valuable insight from our waitress in terms of the taste. After much deliberation I selected 'Blackcurrant and Lavender' and Chelsie chose 'Signature Earl Grey' which would arrive with our food. Chelsie: In light of the numerous celebrations taking place around London at the moment, Kate and I decided we would join in too, and indulge in the Champagne Best of British Afternoon Tea. Within a suitable timeframe our waitress returned, with two flutes of delicious, bubbling Guy Cadel Brut NV Champagne equip with a strawberry each for garnish. As we sat in our chairs, sipping on our champagne taking in the beautiful ambience we felt perfectly content. Our afternoon tea arrived on a beautiful flower encrusted three tier stand, accompanied by a glass filled with delicious, fresh Kentish strawberries and cream. The bottom tier of the stand contained the following finger sandwiches with delicate garden cress across for decoration; coronation chicken, York ham with English mustard, beetroot cured salmon with cucumber, prawn cocktail and a savoury cheese muffin. The middle tier contained both a plain and fruit scone with Cornish clotted cream and strawberry preserves. My favourite tier, the third tier was filled with the following beautiful cakes and pastries: The olympic lemon flame, royal flush fruit cake, chocolate and praline top hat, Victoria sponge, Wimbledon pistachio cupcake, raspberry and cinnamon crown and Queen of tarts. Throughout the afternoon tea unlimited, complimentary refills are available for each tier, which trust me you will want to take full advantage of! The food served throughout this afternoon tea was of a very high standard, alongside being imaginative and mouthwatering. Our favourite item in the afternoon tea, despite tough competition was the Olympic lemon flame due to its flavoursome taste and cuteness! Kate: As mentioned earlier our tea was served whilst we were enjoying our food, and much like our earlier experience tea preparation and indeed enjoyment is something taken very seriously at the Montague on the gardens. Our waitress returned with two pots of tea and a special tea timer accessory that is designed to help you when preparing your tea so you do not over brew or over stew it! The device is from Twining's and features three separate timers for Black, Green and White tea's, our waitress set the timer up and in no time at all we had the perfect pot of tea waiting for us. This was a lovely touch, to a lovely afternoon tea! Chelsie and I really enjoyed our afternoon tea at the Montague on the Gardens. 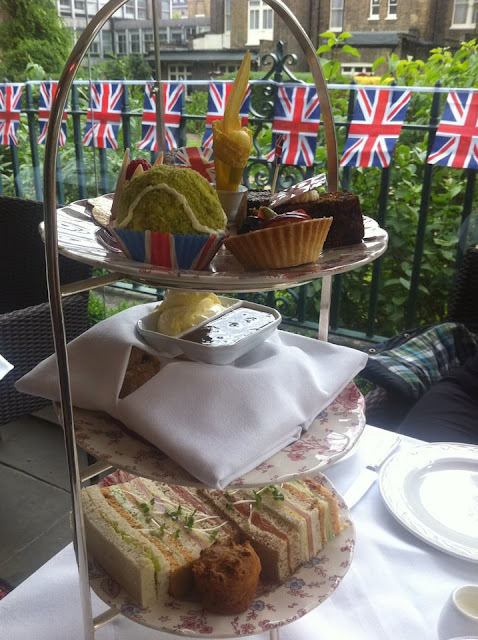 The Best of British afternoon tea is unmissable, and perfect if your looking for an afternoon tea to celebrate both the summer and of course the Olympics! This afternoon tea is ideal for guests looking to enjoy a delicious, quintessentially British afternoon tea in the comforts of a beautiful hotel with friends.